An uproar ensued "on another blog" as they say, when I had my recent article on the CPUC decision republished there. The commenters "on another blog" were, shall we say, less than civil. One of the themes "on another blog" and the comments was that Sowell has no heart, no compassion for the poor who will be badly impacted by mandated time-of-use rates. That could not be farther from the truth. My life has been spent in many efforts to combat poverty, make various retail products more affordable, arguing and advocating strongly against commercial nuclear power because of the high electrical prices that result, and advocating for wind power due to the reduced natural gas prices that brings. Although I never, ever, discuss my legal work, I can say that many of my cases (perhaps most) are on a pro-bono basis or at steeply discounted fees. It appears to me that many people doing the most howling are perhaps the most un-informed on the subject of time-of-use pricing. The article below is from 2003. In the ensuing 14 years, much as changed, but the fundamentals are still true. Technology has also greatly improved. It is now a trivial thing to purchase an inexpensive yet robust appliance timer that can, for example, start a loaded dishwasher in the night after the expensive TOU power period ends. The same is true for a clothes washer that is loaded in the evening, then runs so that the end of the cycle is early the next morning. The homeowner or apartment renter can easily move the clean wet clothes into the clothes drying machine at that time. One can also install a timer device on the refrigerator to prevent it from running between 4 pm and 9 pm, the peak TOU pricing window in San Diego. One can also prepare healthy, nutritious meals in a slow-cooker with a timer, set to start after the 9 pm time frame. The howling complainers appear to object to the high cost of running an air conditioner during the peak 4-9 pm time frame. That, too, can be minimized by first, applying for a poverty discount from the utility. Second, many people already run a freezer to make ice during the night, during off-peak hours. The ice can then be melted near a fan the next day to chill the home or apartment. One can also purchase a water-freezing or chilling appliance to accomplish the same result: use electricity at night at cheap prices, then cool the home the next day and not use expensive TOU peak power. Finally, devices such as lights, TV, computer charging. and other small loads can be powered with a rechargeable battery system, if and when the prices for the battery and control systems become favorable. A time-of-use (TOU) pricing program – entailing for all retail electricity consumers effective differential pricing for peak and off-peak use and meters capable of recording such use – is a public good.1, 2 For this reason, government should mandate implementation of TOU pricing programs by requiring participation by all retail consumers. In particular, such programs should be extended to cover residential and other small retail consumers who presently Â– in contrast to most industrial and commercial consumers Â– are generally not participants in TOU pricing programs. When a state public utilities commission mandates implementation of an effective universal TOU pricing program, the consequent reduction in system-wide peak electricity demand will result in reduced production costs and thereby a reduced price structure for all consumers. As with any public good, this latter benefit cannot be subdivided and will accrue to all consumers – including those who fail to reduce or shift their peak-period demand. This situation parallels the well-known example of a national defense program as a public good. In this latter case, the federal government mandates implementation of the defense program by requiring that all taxpayers participate in the funding of the goods and services needed for national defense. From a macroeconomic viewpoint, it has become well-accepted in the energy industry that peak-period demand by consumers must be reduced, first, in order to utilize system resources most efficiently in the short-run and, second, in order to contain the need to expand system infrastructure in the long-run. In the short-run, when electricity demand is at or near its peak level, supply is highly inelastic as less efficient generating units must be brought on-line to satisfy demand. Under these circumstances, even a small reduction in short-run system-wide demand can result in an appreciable reduction in system marginal costs. In the long-run, supply is more elastic; nonetheless, a reduction in system-wide peak demand will result in a reduced need for new generation and transmission facilities, thus avoiding, or at least postponing, additional capital outlays. Industry experts have long struggled with these issues and have sought to identify effective means to reduce peak-period demand. Their search, however, has been for the most part unsuccessful as it has generally not included extension of TOU pricing mechanisms to residential and other small retail consumers – residential consumers alone account for the largest share of electricity consumption. Often instead there have been appeals for voluntary reductions – as were made in California during its recent energy shortage. But usually such appeals have been only marginally effective at best, even during short-term emergencies. In contrast, the expansion or introduction of TOU pricing programs that would ensure universal coverage by the inclusion of all retail consumers can achieve significant reductions in peak electricity demand and significant associated cost savings. These reductions result most often occur through a shift of electricity demand to off-peak periods, but may also result – although not necessarily – from an absolute reduction in consumption. On the microeconomic level, in order to implement a TOU pricing program, electric meters used by retail consumers must be capable of recording both the volume of electricity demand and the time of such demand. Most electric meters currently installed in the United States, however, are not able to record time-of-use since utilities traditionally have charged small retail consumers a flat perunit rate on the total volume of electricity demanded, regardless of time of day or time of year. Thus, a move from such flat-rate pricing to TOU pricing will require the installation of real-time meters for most retail consumers. However, these consumers Â– particularly residential consumers Â– are not likely to voluntarily purchase the real-time meter needed to participate in a TOU pricing program since for them the cost of a real-time meter is likely to exceed the discounted stream of future savings from reduced charges. This occurs because participation is likely to be limited when it is voluntary, and the resultant reduction in system-wide marginal supply costs and the associated savings will be modest. If, however, all retail consumers – particularly residential and other small retail consumers – were required to install real-time meters and to make electricity demand decisions on the basis of effective differential pricing under a TOU program, aggregate reduced peak-period demand could be expected to result in system-wide cost savings that would exceed the aggregate cost of real-time meter installation owing to a resultant sizeable movement down the supply cost curve. Moreover, with mandated participation, the unit cost of installed meters could be expected to decline due to economies of scale. The aggregate savings from lower electricity charges realized beyond the cost of installing real-time meters are the public benefit engendered by a TOU pricing program. But these savings can only be realized if all retail consumers participate in a TOU pricing program. Therefore, such a program is a public good and must be mandated. The electricity market is somewhat unique in that electricity demand – as that term is conventionally understood – can be both elastic and inelastic depending on the time frame and the pricing structure. In order to understand this apparent anomaly, it is important to distinguish between electricity demand and electricity consumption. To this end, the term demand in this paper refers exclusively to the instantaneous electricity load or rate of use Â– in other words, the draw on system resources as measured by the instantaneous output required of generation resources. In contrast, the term consumption refers to electricity use over time. The purpose of price-responsive demand systems generally, and TOU pricing in particular, is to reduce demand – as defined above – during peak times by shifting it to off-peak times even if total consumption (peak plus off-peak) remains unchanged. Thus with these definitions, it becomes clear that electricity consumption can be observed to be inelastic while electricity demand at a specific time can Â– if priced effectively Â– be observed to be elastic. It is this characteristic of the electricity market that allows TOU pricing to be effective even when increases in flat-rate prices have limited effectiveness in reducing demand. The problem with flat-rate price increases is that they are targeted at reducing total consumption of a highly inelastic commodity Â– a difficult goal to realize. In contrast, TOU pricing is able to take advantage of the relatively greater elasticity of time-specific demand. The relative inelasticity of electricity consumption and its non-responsiveness to flat-rate price increases arise largely for two reasons. First, with reference to both the short-run and the long run, electricity has become fundamental to maintaining and improving the quality of life. The technological developments that have significantly improved the quality of life over the past century have been largely dependent on electric power. Consequently, consumers are reluctant to reduce electricity consumption since they are reluctant to undergo a deterioration in their quality of life. In witness to inelastic consumption and consumer attitudes, electric systems in industrialized countries have been constructed to provide virtually-guaranteed electricity when demanded by users. In the United States, for example, utilities strive for a 99.9 percent or better reliability factor – meaning that 99.9 percent of electricity demanded will be delivered. Second, in the short-run, electricity consumption also is inelastic and non-responsive to price increases because electricity is essentially an input to durable goods that have long lifespans and are replaced only slowly in response to higher prices for the input. For example, consumers will not readily replace a serviceable electric hot water heater with a natural gas heater in response to a sharp electricity price increase relative to natural gas. But, they will make this substitution in the long run when the durable good needs replacement if the price differential between electricity and natural gas has remained sufficiently large and persistent. In the interim, electricity consumption is inelastic. This difference in pricing regimes is rooted in the historically high cost of introducing TOU meters for residential and other small retail consumers. The hardware cost of such meters has fallen in recent years, however, and recent data place the cost at approximately $80 for a retrofit and up to $200 for a replacement meter.4 These costs exclude installation charges and the cost of additional infrastructure needed at the utility. Despite the now lower prices of TOU meters, for most residential consumers – and even some small commercial consumers – the cost of purchasing and installing a TOU meter is still likely to exceed the present value of the savings offered by reduced electricity charges. This situation occurs because few customers are likely to apply a rate of time discount to the future cost-saving stream that is sufficiently low to justify the outlay cost for a TOU meter. Moreover, the ability of utilities to provide financial incentives to retail consumers to purchase TOU meters and to enter TOU programs is limited largely for two reasons. First, the potential electricity cost savings that a utility can offer to a retail customer for participation in a TOU program is limited by the cost savings that would accrue to the utility itself. But these savings are likely to be modest because, while most electric utilities in the United States are for-profit entities, their profits are constrained by state regulation. Commonly, state public utility commissions permit utilities to recover all of their prudently-incurred costs plus a set rate of return on their capital. However, retail electricity rates charged by a utility generally change only following a rate review by the commission – which occurs usually every several years or so. At that time, the state commission is likely to recognize any savings to the utility resulting from implementation of a TOU pricing program and, all things being equal, to require the utility to lower its rates to reflect its reduced costs. Thus, the savings to the utility resulting from implementation of a TOU pricing program – or a sizeable portion thereof – are likely to accrue to the utility only until its next ratemaking proceeding (rate case).5 Second, as the reduced peak electricity demand of a single small retail consumer is unlikely to have an appreciable impact on the utility's costs, the utility is necessarily limited in its ability to promise this consumer significantly reduced rates for entering a TOU pricing program. For both of these reasons, there is little if any incentive for an electricity utility to voluntarily implement a TOU pricing program or even to offer a program to small retail consumers Â– such as residential consumers Â– for their own choosing. Residential customers as a group, however, account for the largest share of electricity consumption in the United States. The U.S. Department of Energy estimates that for calendar year 2001, residential customers used 35.4 percent of the retail electricity consumed in the United States, as compared to 29.3 percent for industrial users and 31.9 percent for commercial users.6 Due to the lack of information on time of use by non-TOU consumers, it is difficult to determine how much residential consumers contribute to peak demand. However, it appears likely that residential demand plays a large role in determining the level of system-wide demand during all hours. As a result, while the economic incentives may not exist for either utilities or individual residential or other small retail consumers to adopt TOU pricing, the potential to reduce system-wide demand during peak periods by implementing TOU pricing for these consumers is large indeed. Participation in TOU programs by residential consumers is presently limited in the United States. Apart from the reasons laid out above, some industry observers have suggested that residential consumers, regardless of TOU meter costs, simply prefer the simplicity of fixed-rate rather than TOU-pricing. However, at least one industry observer has criticized this latter position, suggesting that limited participation is simply the result of consumer inertia and that, if TOU pricing were offered as the default, few consumers would opt out.7 Yet TOU programs do exist and are available for customers, if only on a limited basis and/or as part of a pilot program. While information from a broad survey on the scope of residential TOU pricing is not available, anecdotal evidence suggests that many utilities do offer TOU pricing to residential customers. For example, the Potomac Electric Power Company (PEPCO), which serves Washington, DC, and its northern suburbs, has offered TOU pricing to its Maryland residential customers since 1984. In microeconomics, a public good is a good or service that lacks depletability and excludability.15 Non-depletability means that one person's use or enjoyment of a public good does not reduce the ability of others to enjoy it and receive its benefit. Non-excludability means that persons cannot be prevented from enjoying the benefits of a public good regardless of whether they pay for it or not. Given this non-depletability and non-excludability, the problem posed by a public good for economics and public policy is that few if any people would be willing to pay for a public good voluntarily. Rather, if a public good is to be produced, the government must mandate the financial support of the good by all persons who will enjoy its benefits. A universal TOU pricing program for all retail electricity customers with effective differential pricing for peak and non-peak electricity use satisfies the two basic criteria for a public good. Accordingly, such a program should be mandated. Although economists have only recently begun to model the electricity supply market, it is generally recognized that, when not subject to price regulation, the short-run supply curve for electricity is relatively elastic at low volumes of production, but becomes highly inelastic as the quantity of electricity produced nears the maximum level that the system is capable of generating.16 Under these circumstances of inelastic supply, even a small reduction in short-run demand can result in an appreciable reduction in system marginal costs. 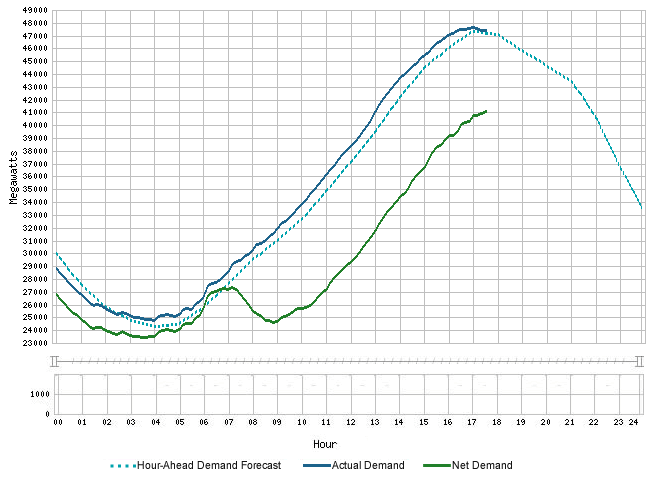 But how can an electric system achieve such a reduction in short-run demand? The fact of the matter is that consumers will not reduce electricity demand unless and until they have a financial incentive to do so. On a long-run basis, retail consumers can be incentivized to reduce demand through higher prices for electricity generally. However, such an approach would likely overachieve insofar as it would likely reduce overall consumption when the primary goal is to reduce peak demand. Reductions in short-run peak-period demand may be achieved by providing consumers sufficient financial incentives to either reduce demand during peak periods or, more likely, to shift demand from peak to off-peak periods Â– where the short-run market equilibrium is on a less inelastic/more elastic portion of the short-run supply curve and thus marginal production costs are lower. A TOU pricing program will effectively provide the needed financial incentives for consumers to shift their demand from peak to off-peak periods – provided there is a sufficiently large price differential depending on the time of day and time of year of electricity use.17 For example, the residential consumers participating in PEPCO's TOU program pay in non-summer months (November through May) a generation service charge of 1.9¢/kwh off-peak and 2.7¢/kwh – or 42 percent more – on peak (and 2.1¢/kwh during the shoulder periods). In summer months, they pay 1.7¢/kwh off peak and 19.4¢/kwh on peak – an eleven-fold higher rate (and 2.2¢/kwh in shoulder periods). By comparison, residential consumers not in PEPCO's TOU program pay a flat-rate generation service charge of 5.5¢/kwh during the summer months and, during non-summer months, pay 3.5¢/kwh for the first 800 kilowatt-hours and 2.7¢/kwh thereafter. This TOU pricing regime provides consumers with strong incentives to shift their discretionary electricity demand to off-peak periods by, for example, shifting the use of washing machines, dryers, and hot water heaters. Moreover, high summer TOU peak-period rates like those charged by PEPCO encourage some time period shifting of electricity demand for air conditioner use by cooling down before and after the peak period and using higher air conditioning temperature settings during the peak period. Further research is required to determine the circumstances under which a mandated TOU pricing program for all consumers would be cost-effective. To a large extent, the cost-effectiveness of such a program would depend centrally on two factors: first, the frequency with which short-run demand in a particular electricity system reaches the highly inelastic portion of the supply curve; and, second, the quantity of discretionary demand that consumers would, if provided the appropriate financial incentives, shift to off-peak periods. For example, in California, a widespread TOU pricing program may hold significant benefits since serving peak demand in the state often requires the use of 90 percent or more of available generating resources. On the other hand, in a system with significant generating reserves at all times, demand may never reach the inelastic portion of the supply curve and thus a shift of demand from peak to off-peak hours in such circumstances may not appreciably reduce system-wide short-run marginal costs. These issues as well as those concerning political feasibility of implementing a TOU pricing system would need to be explored before participation in a TOU pricing program is required of all consumers. † The views expressed in this paper are solely those of the author and do not necessarily represent the views of Troutman Sanders LLP or its clients. The author would like to thank Troutman Sanders LLP for its generous support of this paper. 1 Retail electricity customers in the United States are generally classified into one of three categories –industrial, commercial, and residential. 2 Peak hours are those during which system-wide electricity use is greatest. Commonly, the peak period begins between 8 am and noon and ends between 6 pm and 8 pm, Monday through Friday, with off-peak periods occurring during the remaining weekday hours and throughout the weekend days. The precise times for these periods vary from one region of the United States to another and even from one utility to another within a region. 3 Georgia Power, for example, introduced TOU meters for large industrial customers in 1992. Ten years later, approximately 1,650 business customers used such meters, with peak demand for these consumers falling 17 percent since they began using TOU meters. Justin Colledge, et al., "Demand Side Management: Power by the Minute," Power Economics, Feb. 28, 2002. 5 In the United States, this system of performance-based ratemaking (PBR) generally provides electric utilities little incentive to expend resources in order to reduce operations and maintenance costs except to the extent that such expenditures can be recouped before the utility's next rate review. Recognizing this lack of incentive for innovation, some utility commissions have begun to adopt a modified PBR system under which, for example, half of the cost savings are passed on to consumers through reduced rates and half accrues to the utility through increased retained profits. 6 U.S. Department of Energy, Energy Information Administration, Electric Power Monthly, September 2002, Table 44. The year 2001 is the last year for which, as of this writing, a complete calendar year of data was publicly available. The balance of electricity consumption (3.4 percent) is attributable to uses other than by industrial, commercial, and residential consumers, such as public street and highway lighting, other sales to public authorities, sales to railroads and railways, and sales for irrigation. 7 See Lisa Wood, the Brattle Group, Comments Delivered at Seventh Annual Washington Energy Policy Conference, "New Developments in Electric Market Restructuring," Paul H. Nitze School of Advanced International Studies, The Johns Hopkins University, May 21, 2002. In this regard, the May 2001 effort by Puget Sound Energy to make TOU pricing the default pricing system for 300,000 of its residential and small business customers resulted in only one percent of customers opting out of that system. 8 PRD generally refers to any system under which demand is significantly responsive to price changes. In other words, PRD refers generally to systems designed to enhance the elasticity of demand. In the context of electricity, PRD systems include, in addition to TOU pricing and other similar regimes, interruptible load programs and demand bidding. In the former, customers agree in advance to have their energy use curtailed when system demand or real-time wholesale prices reach a certain level. In the latter, buyers offer into realtime energy markets a quantity of demand that they agree to curtail for a certain price. 9 U.S. Federal Energy Regulatory Commission, Remedying Undue Discrimination through Open Access Transmission Service and Standard Electricity Market Design, Notice of Proposed Rulemaking, FERC Stats. & Regs. 32,563 at P 113, 390-94 (2002). 10 United States Congress, H.R. 4 (Pub. Print) § 241, Energy Policy Act of 2002, 107th Congress (2002). 11 Jamie Wimberly, President of the Center for the Advancement of Energy Markets, Comments Delivered at Seventh Annual Washington Energy Policy Conference, "New Developments in Electric Market Restructuring," Paul H. Nitze School of Advanced International Studies, The Johns Hopkins University, May 21, 2002. 12 California Energy Commission, 1988-2000 Historical Coincident Peak Demand and Operating Reserve, available at www.energy.ca.gov/electricity/peak_demand_and_reserve.xls. 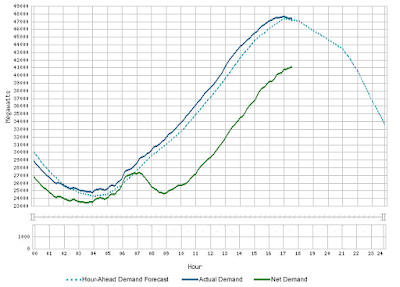 This figure represents peak demand in the CAISO control area on the day of the year with highest statewide peak demand, i.e., state coincident peak demand. The CAISO's control area encompasses approximately 85 percent of the state's demand. 13 The U.S. Department of Energy's Energy Information Administration (USEIA) estimates that during the summer of 2001 involuntary peak demand reduction during electricity outages ranged from 1,825 to 5,500 MW. The USEIA states that "one of the significant uncertainties in these projections of electricity outages is the amount of electricity demand reduction that is either voluntary or motivated by high electricity prices." USEIA, "Electricity Shortage in California: Issues for Petroleum and Natural Gas Supply," June 2001, available atwww.eia.doe.gov/emeu/steo/pub/special/california/june01article/casummary.html. 14 See Colledge, et al., supra n. 3, noting a 2001 pilot program by Puget Sound Energy (PSE). This program involved 300,000 residential and small business customers. See also"All About Time-of-Use Metering," Metering, 2000 Issue 3. Noting TOU experiments in California, Washington and Florida, this article indicates that peak demand could be reduced by three to five percent. In late 2002, PSE terminated the program due to the fact that on average customer bills increased 80 cents per month. See Ahman Faruqui & Stephen S. George, "Demise of PSE's TOU Program Imparts Lessons," Electric Light & Power, Jan. 2003, at 1; Candace Heckman, "PSE Plan Expected to End," Seattle Power-Intelligencer, Nov. 15, 2002, at B4. For the author, this situation is evidence, not that widespread TOU pricing cannot reduce costs, but that costs cannot be reduced unless TOU pricing is widespread. 15 Most economics texts agree that non-depletability and non-excludability are the key factors in defining a public good, although the texts disagree to a certain extent as to whether each of these two factors is a necessary condition or simply a common condition. See, e.g., James M. Henderson and Richard E. Quandt, Microeconomic Theory at 298 (3rd ed. 1980) ("Each member of society gains satisfaction from the total output of a public good. No one's satisfaction is diminished by the satisfaction gained by others, and it is not possible for anyone to appropriate a public good for his own personal use, as is the case with ordinary goods. "); William J. Baumol and Alan S. Blinder, Economics Principles and Policies at 939 (4th ed. 1988) ("A public good is defined as a good that lacks depletability. Very often, it also lacks excludability. "); Walter Nicholson, Microeconomic Theory at 815-15 (6th ed. 1995) ("A good is a (pure) public good if, once produced, no one can be excluded from benefiting from its availability. Public goods usually also will be non-rival, [i.e., consumption of additional units involves zero social marginal costs of production] but that need not always be the case."). A TOU pricing program is characterized by non-excludability as the benefits of reduced system-wide costs engendered by such a program will accrue to all users of the electric grid regardless of whether or not they participate in such a program. Similarly, a TOU pricing program is characterized by non-depletability as one consumer's participation does not prevent others from similarly participating. 16 The issue of why the supply curve becomes so inelastic as it approaches the maximum system output level has been the subject of much debate since the California energy crisis of 2000-2001. While some assert that this situation is the result of low-efficiency peaking generators seeking to recover their fixed costs during only a few hours of the year, others assert that sellers engage in price gouging when demand is at its highest. 17 Under the PSE pilot program noted above, TOU rates were approximately 15 percent lower than flat rates during off-peak hours and 15 percent higher than flat rates during peak hours. See Faruqui & George, supra, n.14. The author believes that the relatively small rate spread may have been a cause of the program's failing to deliver the expected savings to participants. 18 See, supra n. 3. 19 McKinsey and Co., "The Benefits of Demand-Side Management and Dynamic Pricing," May 2001. Original Copyright 2017 Thomson Reuters. All rights reserved. Re-Published on SowellsLawBlog as educational material, not for profit. a greater supply of solar and wind energy, most people will see a reduction in their monthly bills.